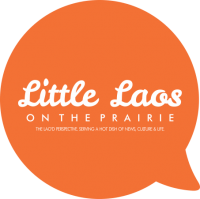 This year marks the 40th anniversary of the Lao diaspora. 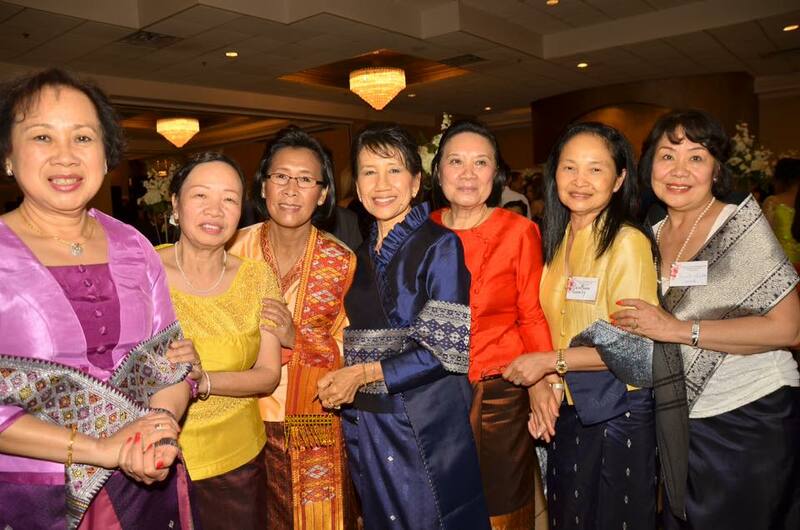 And for some former Lao teachers, it took all 40 years to be able to reunite with past classmates and colleagues at the 3rd Lao Teachers Reunion. The biannual event took place from June 27th-June 29th, 2015 in Streamwood, Illinois and brought together nearly 700 guests from all over the world, including the U.S., France, Australia, Canada, and Laos. The attendees shared one common connection: they all spent their early teacher training days at the School of Pedagogy in Dongdok Village, Vientiane. The festivities kicked off on Saturday with a dinner reception and evening soiree at The Seville Banquet and Conference Center. The program began with opening remarks by past and present organizers, followed by an energetic performance of the song, “Dae Pheuan Kru,” (“For My Teacher Friends”). The song, written by esteemed Lao song writer Ajarn S. Sengsourivanh who was also in attendance, expressed the strong bonds of kinship among Lao teachers, eloquently capturing the emotions of the evening. The night continued with traditional Lao dance performances as well as a Lao band that encouraged guests to dance the night away. Though the performances provided great entertainment throughout the night, the highlight for most attendees was the opportunity to catch up with long lost friends, reflect on past experiences, and recognize exemplary educators in the community. 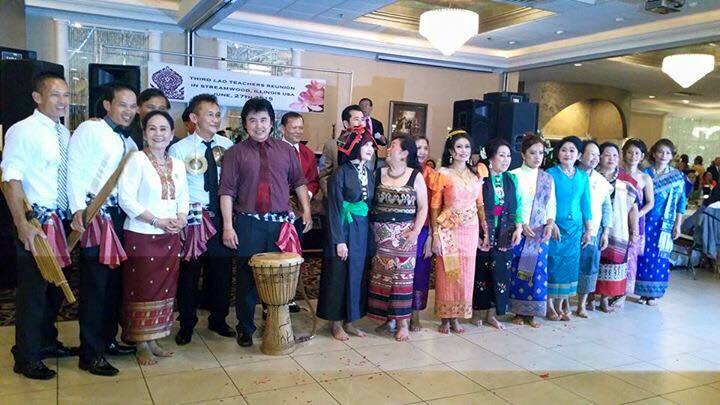 For Minnesota-based Ajarn Banlang Luangvija Phommasouvanh, who served as the event’s Public Relations Chair, the weekend was also a way to celebrate Lao heritage. Ajarn Banlang Luangvija Phommasouvanh, pictured left, was one of the Public Relations Chairs for the 3rd Lao Teachers Reunion. Reunion activities continued with a picnic and baci su khwan ceremony at Wat Lao Buddharam on Sunday, and an tour of Chicago on Monday. Many attendees took full advantage of the various opportunities to reconnect with former classmates. And now, with the continuation of the Lao Teachers Reunion in 2017 and the growth of social media, many of these former teachers will no longer have to wait 40 years to revive lost friendships and relive their old memories. Instead, they will be creating new ones. 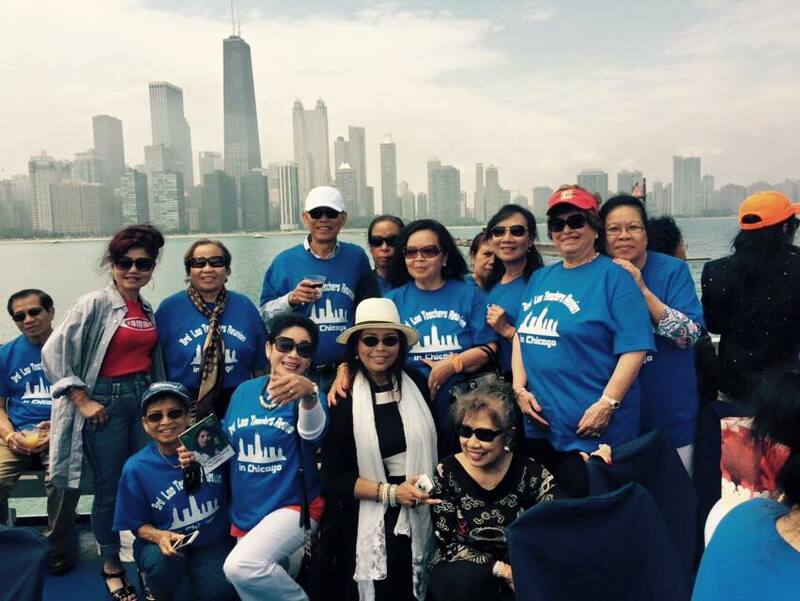 Former Lao teachers don matching blue t-shirts on a tour of Chicago during the 3rd Lao Teachers Reunion.